Seraphina Dombegh is a court musician in the kingdom of Goredd. The land has been at peace for years, ever since a tentative peace was brokered between humans and dragons. As the anniversary of the treaty draws close, dragons begin to arrive to the court in human form to attend the celebration. When a member of the royal family is murdered, seemingly by a dragon, no one at court is above suspicion. Seraphina has a secret reason for wanting this mystery solved and begins assisting Prince Lucian in the investigation. Will her involvement in this court catastrophe reveal her own hidden origins? As you know if you often read this blog, I approach YA novels with a certain amount of trepidation. But I'm trying to move past that. When I heard that this story was set in a fictional past and that its heroine is a musician, I thought this might be one I could get into. As it turned out, I really enjoyed this book. Seraphina is slated to have a sequel published next year and I think Hartman has created a world and a group of characters who are deserving of multiple books. While this is an imagined world with imaginary conflicts between dragons and people, there are obviously a lot of parallels to be drawn about those who have power and a sense of belonging and those who are on the outside. In Seraphina's world, dragons are outcasts who are forced to wear bells around the neck when in human form so that everyone can avoid them. Despite their great power, they are the lowest members of society. Seraphina herself is a really compelling character. She is guarded with other people because she doesn't know who she can trust, but she is also incredibly resilient and layered. While I liked her a lot, she often struck me as very mature for her age. We are told she is 16, but she thinks and acts much older than that. She has a great deal of responsibility, as someone who is responsible for instructing musicians and organizing music for the entire kingdom. She also has a firmly established sense of morality for a teenager and has the ability to really empathize with others and consider their feelings and reactions. It's a wonderful change from the typical self-centered teenage heroine. I also really appreciated the romantic aspect of this story. It's easy to tell, fairly early in the story, that Seraphina will begin a romance of some sort with a certain character. But it's not the crux of the book. It's a slow build and the story is more about Seraphina coming to terms with who she is and how she navigates her world than about her feelings for the other character. Seraphina's experiences could stand without a love interest, but having one certainly adds some tension to the story. 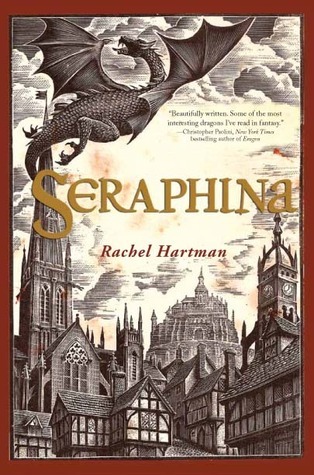 Rachel Hartman's Seraphina is a perfect book for immersing yourself in another world. It's a fantasy world with rich characters and a fast-moving story and a YA book with a protagonist who cares more about self-awareness and the world around her than the cute boy next door. I am glad that I gave this book a try and I look forward to seeing what happens in the sequel. I got this book on a kindle daily deal - I didn't realise it was YA until reading your review! But I think it sounds very interesting, so I'm glad you enjoyed it. It doesn't really feel like YA while you are reading it (which is sort of a good thing, in my opinion). I guess it's classified as YA because of the age of Seraphina, but it really feels like anyone could read it.